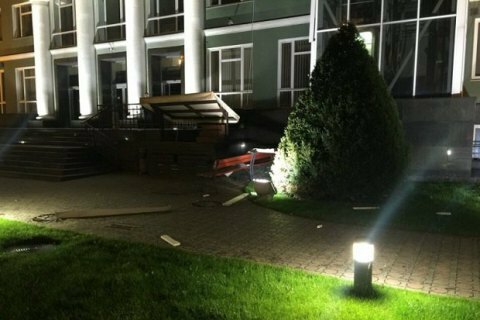 Elevator shaft of a bank office at 6/1 Krasnov St. was damaged at 23:28 last night by a grenade launched from Mukha bazooka, Odesa Public TV reported. In social networks eyewitnesses claim that two explosions could be heard. The elevator shaft of the bank Pivdenny located in the building was badly damaged. "Investigators, K-9 team, blast squad and forensic experts immediately went to the place of incident," local police HQ said in a statement. A used barrel rocket launcher was found in the bushes across the street from the building.